【明報專訊】Mrs Ho is the petite elderly owner of Lee Wo Steelyard, a hawker stall down an alleyway in Yau Ma Tei. 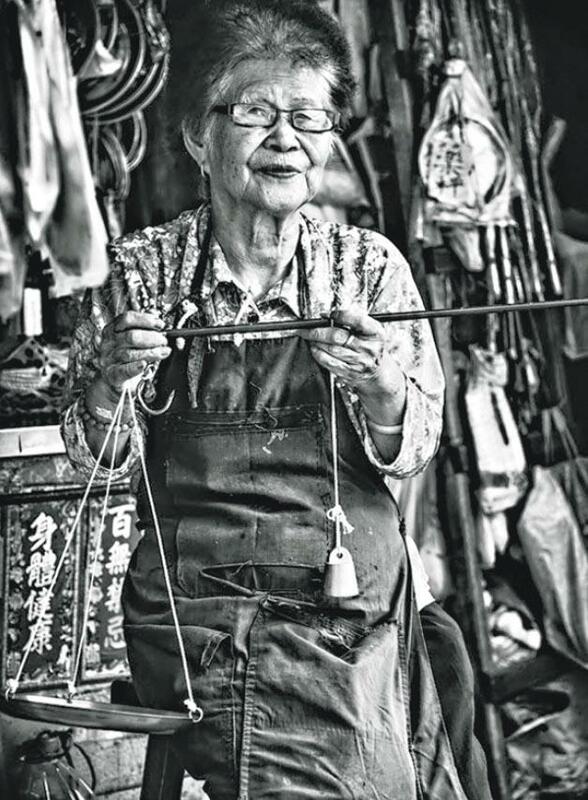 It has been operating for 90 years and was once run by her father, who taught her how to handcraft the traditional scales when she was just 12 years old. With declining business and deteriorating eyesight, Mrs Ho relies on the help of an old friend to make the scales and spends much of her time now listening to Chinese opera on the radio, remembering the days when the shop would be busy with orders. Although, she says, fewer people know how to use the scales, she still has a handful of loyal customers. An ordinary set costs about HK$200 whereas the largest, which fishermen use to weigh their catch1, costs HK$980. Mrs Ho's children want her to retire, but she says she still enjoys her work and chatting to customers too much to step aside. Plus, she always finds time to spend with her grandchildren.